Note: The product reviewed is part of an ongoing Kickstarter campaign, and may be incomplete. The project may change before it hits the market, and so this review should not be taken as a comment on the quality of any complete products. We will do our best to update this review to reflect changes in the product, but we may lag behind. 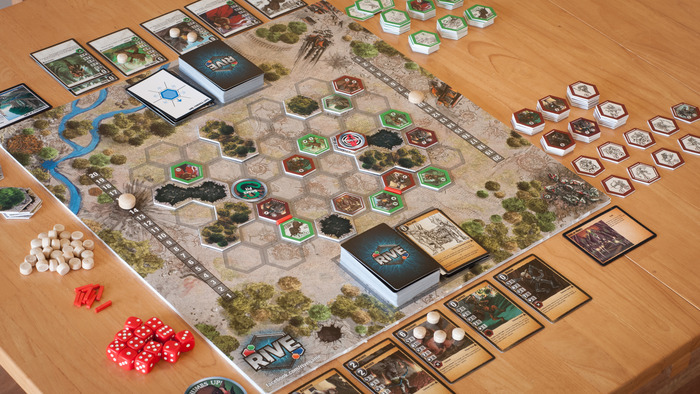 Today, we are going to take a closer look at Rive, a hex-based strategy game that was featured as one of our campaigns of the week this Tuesday. Rive is a strategy game where players control one of the game’s four factions – the cybernetic A’pathi, the ferocious Horde, the druidic Mystics, and the militant Terrans. Rive can be played by 2 or 4 players, and took us about 1-2 hours to play. The game is text heavy, so expect play time to depend on language competency as well as comfort with strategic play. Overview: Rive puts an interesting twist on familiar elements to produce an easy to learn game with engaging game play. While the factions are not terribly novel, they are clearly distinct and strongly thematic. Each unit plays a well-defined role in their faction’s strategy, and there are relatively few cards that aren’t useful. The rules are straightforward once you get accustomed to the phase progression, and I found that my first guess was correct for almost every rules question we encountered. While Rive is not a perfect game, the pro’s outweigh the con’s, and I recommend you seriously consider backing the game. Setting up Rive is a simple affair so long as you use the default deck configurations. First, each player picks a faction and selects the corresponding deck. Next, turn the board to the proper side (one side is for 2 players, the other for 4 players). Then, determine which player goes first by rolling a die and place terrain pieces on the board in turn order until someone passes. Finally, each player places their fortress in turn order. While drafting your own decks will slow things down, you will probably want to do this once you have a feel for the faction decks. If you play simply with the full deck every time, you will probably find that the games start to feel very familiar. Varying up the deck composition will give more variety to how the factions play. You lose if your fortress is destroyed. You win if the other player’s fortress is destroyed. It is really very straight forward. Move along, there is nothing to see here. There are four basic kinds of cards in Rive: unit cards that allow you to place units on the board, manipulation cards that let you reposition units, equipment cards that modify units, and action cards that have various effects. Some cards have costs, represented by a large number at the top left of the card. To play a card, you have to discard a number of cards from your hand equal to the cost of the card you want to play. This is somewhat reminiscent of San Juan, and I love this system as a way to keep things simple while allowing for variations in value and cost among the cards. Each round of Rive consists of a placement phase, a combat phase, and a pre-placement phase (this is only used for a few special actions, so I’m going to focus on the other two phases). During the placement phase, players play unit cards, manipulation cards, equipment cards, and placement action cards. Each player completes their entire placement phase in turn order. Once all players have completed their placement, play progresses to the combat phase. The combat phase breaks down into three sub-phases. First, the pre-combat phase allows players to play combat action cards. These can range anywhere from giving a buff to your entire army to dropping a bomb on some troublesome enemy units. Second, during the initiative combat rounds units make attacks on any units or fortresses they are facing or use their special abilities. Unit actions are resolved in descending order of their initiative value, so the highest initiative value gets their actions to resolve first. This means that slower units may be dead before they ever get to act, but units of the same initiative have their actions resolve all at once. Finally, there is a phase for special post-combat actions. There is more to Rive’s combat than I will cover (see the rule book for more details), but it is worth running through the major stats on each card and how they affect combat. Units have five stats, other than cost. As mentioned above, a unit’s combat initiative tells you when it acts in the combat round. The rest of the numbers tell us what happens when one unit attacks another. When a unit makes a standard attack, you roll a number of dice equal to the unit’s attack dice number.Take the attacking units attack bonus value and subtract the defender’s armor bonus, and add the resulting number to the value shown on each die. For each result that is greater than 6, the attacker inflicts a wound on the enemy. When a unit takes more wounds than its health score, it dies. The biggest thing that sets Rive’s game play apart from similar games is the focus on unit placement. Most units – save those with the ‘mobile’ or ‘turret’ keywords – cannot alter their position after they are placed without the help of manipulation cards, and those with the ‘Colossal’ keyword can’t be moved even then. 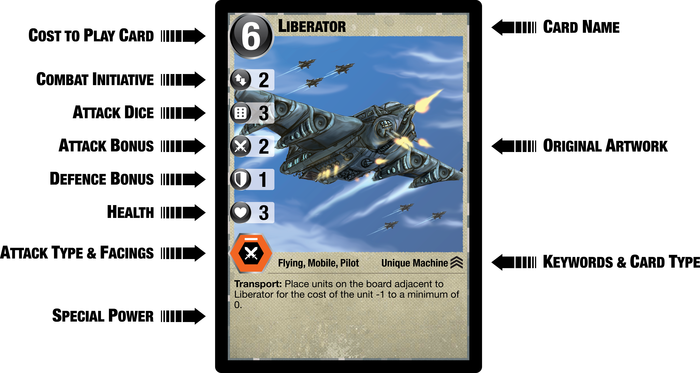 This includes not just location on the board, but the direction that units are facing. Since units typically can only act on a few faces, this means that a poorly placed unit quickly becomes useless until you get lucky enough to reposition it. On top of that, manipulation cards provide only minor adjustments (either one space of movement or rotation of unit facing) per card, and enemy manipulation cards can be used to move your units into worse places. This means it is not terribly hard for a unit to spend the majority of the battle staring intently at a tree. Rive’s rules are generally pretty easy to follow, and the rules card captures most of what you need to know. The focus on placement over movement sets Rive apart from the more movement focused strategy games that seem to dominate the market. It is an enjoyable change of pace that forced me to rethink my general approach to strategy games. Rive’s factions are thematic, and every faction card cleanly plays into their play style. There is a very clear idea of what makes each faction distinct from the rest. Rive’s rules are relatively easy to learn and simple to adjudicate, helping game play to flow smoothly. A lot of Rive’s content is thoroughly unremarkable. 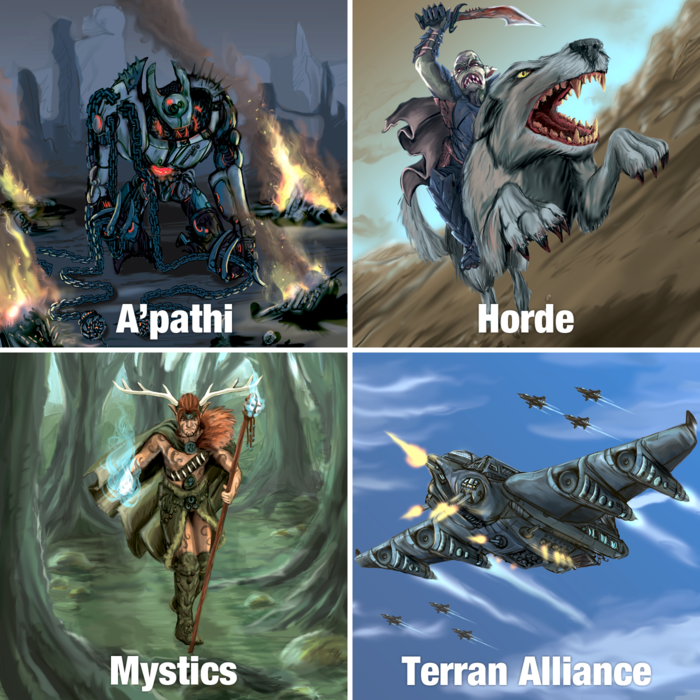 The factions are familiar generics – druidic Mystics complete with walking trees and animal companions, the savage Horde of orcish warriors, etc. The card art is a solid B+ – good quality, inoffensive, but ultimately unoriginal. Everything looks pretty much exactly how you’d imagine, no better and no worse. As a result, Rive sounds and looks a lot like that other game you played once. At $69, Rive is a bit expensive. This puts it in the ‘big purchase’ category, and I am generally a bit nervous to make that sort of purchase without knowing what to expect from the company as they move forward. If we could be sure that Rive will get expansions and other sorts of continuing support, this would be fine. However, with a small company, it is hard to be sure of that. Accordingly, Rive might have priced itself out of the market. The current draft of the rules seems to give the first player an advantage in setting up terrain. The first player always places their fortress first, even if they are the one who passed to end terrain placement. This gives them an advantage in securing ideal placement for themselves. It might be best to have fortress placement order determined after the terrain has been placed, so players wouldn’t know when they would be placing their fortress while building the terrain. I think this would force players to focus on more interesting and equal terrain placements rather than rigging the terrain in their advantage. Having each player complete their whole placement phase at once means that at least on player is totally unable to adapt to the other, and minimizes the strategic interaction between players’s placements. I think it would be much more interesting to have each player play one card in turn order until all players have passed. You would get more interaction, more complex strategic considerations, and have less down time between each players’s moves. Current Kicktraq projections have Rive falling short of its goal, which is a real shame. If Rive doesn’t fund, it won’t be because of the quality of the game itself. It will be because the word didn’t get out fast enough, the game wasn’t promoted well, or issues in how the Kickstarter campaign itself was conducted. A more careful relaunch of the campaign seems very likely to be successful. There are certainly some issues with the game, but – other than the generic look and high price point – they could be fixed pretty quickly if Slingin’ d6’s revisits the rules. Worst case scenario, we can always add a house rule. Even where the game is generic, the work is good enough quality that it won’t be terribly upsetting. The factions may be familiar, but Rive captures their unique flavors so well that I find them standing out from the numerous iterations of these factions I have seen elsewhere. The only real worry to keep in mind is the price point, which is going to be high enough to dissuade a lot of backers. Nonetheless, I think that Rive is a game that deserves to be made, and going to be worth the investment for anyone looking for a good strategy game. If you have room on your gaming shelf, and the cash to spare, Rive is a game worth funding. 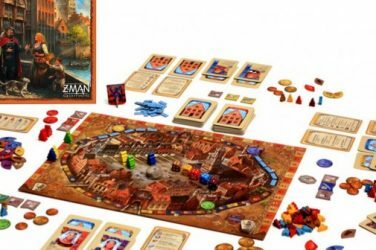 It is an interesting twist on strategy gaming that is fun and easy to play. I recommend Rive to anyone interested in picking up a strategy game. As always, if you have any comments, questions, or suggestions – kick them our way in the comments.